If you've been around on BJJ forums for any length of time, especially NHBGear (now defunct, it would appear), then you know who Dave Jacobs is. I've also come across him due to Seymour's posts about seminars Jacobs' has done at Mill Hill, plus there was an interview with him in JJS a while ago, IIRC. My host here in Virginia, Adrienne, is an old student of Jacobs. 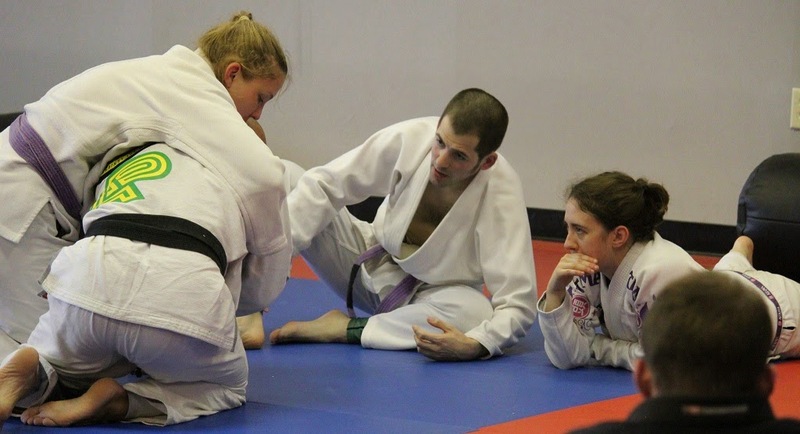 She therefore was keen to support his seminar at Tidewater BJJ: that fit well with my plans, as not only did it mean I would get to train with a top black belt and internet personality, I'd also be able to rest my neck (rather than getting in lots of sparring, the other option today). After a cool opening speech about his ethos for BJJ (all of which I agreed with, so his school sounds like a great place to train), Jacobs ran us through a couple of warm-up drills. The first was similar to the open guard drills I learned from Kev, specifically the third one where you do a hip swing to recover guard. Jacobs call it a 'reverse shrimp' and does the same motion of popping up onto your toes with your bum in the air, but from the same starting position as a shrimp. We then did that with a partner, when it became almost exactly like I'm used to, except that your partner stays up rather than shifting into knee on belly. The final drill was doing the motion of a butterfly sweep (i.e., rolling to your side and kicking a leg up high, basing on your shoulder, head and hand), then swivelling through into scarf hold (the same leg you lifted into the air now goes underneath, so you end up facing the opposite way to when you started). Getting into the techniques, Jacobs started off with a concept he called the supine twist, or rather that's what it is called in yoga. As he put it, great position in yoga, but terrible if somebody puts you there in jiu jitsu. Essentially, you're shoving their legs one way, knees pinned to the mat, while aiming to shove their head the other way. To illustrate that concept, Jacobs taught a variation on the transition from side control to mount. That begins in the normal way, driving your knee across the belt line. The finish is where it's a little different. Keep driving your leg across until the knee pokes out a little past their leg. You're then going to slide it backwards into that leg, scraping it into their outer thigh. Your aim is to push their legs together, then slip your leg to the ground. They should find it difficult to step over and pull your leg into half guard, because you've pushed it backwards. Jacobs also briefly showed how the 'supine twist' could apply to passing quarter guard, bringing your knee across their body, shoving their legs one way and shoving your head next to theirs, pressing into their skull to turn it in the opposite direction. After a short break, we moved on to a more extensive session. Jacobs is a big fan of butterfly guard, especially the armbar from there. He mentioned that he has a lot of trouble landing the standard armbar against anybody with experience. His preference is to instead use a pressing armbar from butterfly. Personally I've always found those difficult, but then I rarely use armbars of any type, because it requires more space than I would like (at least when you compare it to my favourite attacks, which are chokes and bent armlocks). I last saw this taught by Nathan Leverton at one of his Leverage Submission Grappling seminars. Jacobs has a comparable set up, though this is from butterfly rather than closed guard. With both your butterfly hooks in, grab both their collars and drop back. It's important to stay as 'one unit', by which Jacobs means there isn't any separation between your bodies. They will normally post out their hands if you knock them forward like that. Get an over-under grip, wrapping one arm around their head, the other under their arm. Trap the wrist of their outstretched arm between your head and shoulder. You then want to get your head arm over towards their shoulder. To do that, use your shins to push them backwards, hopefully providing the necessary space to bring your arm over the head and establish a lock by the shoulder. Next your want to get your feet onto their hips so they can't stack you, turning your body to also clamp your knees on either side of their shoulder: Leslie calls this the 'shoulder sandwich', a helpful way of remembering the positioning. Put your hands in a gable grip and slide them down their arm until you are just above the elbow (finding that spot is one of the parts of this technique I struggle with). Once there, press down with your hands for the submission. If they manage to circle their trapped arm off your head, you can still attack. Slide the top hand of your gable grip up, ready to catch their wrist before they circle their arm over. Establish a figure-four grip on their arm, then twist that arm away from you. This might get the submission, but more likely is that you steer them over, reversing the position to mount. As you transition, put your elbow by their head and move right into an americana from mount. You can also finish the pressing armbar from mount too, by sweeping them as you have the grip. Just put in your hook and lift the leg up and over as you normally would with a butterfly sweep. The same principle then applies, sliding your arms up their arm until you get to that point above the elbow, exerting pressure for the tap. Alternatively you can switch to whatever submission you like. Leslie has been working on her aggression for some time, though that is a complicated term for both of us: she has had similar hang-ups in the past. Leslie gets into a very interesting discussion of the topic over on her blog (extending into the comments here). As we were doing that technique, she said she'd be updating it to reflect her current perspective. I'm looking forward to reading the additions: Leslie's writing is always thought-provoking. Next up was a more unorthodox position, the crucifix, although it is becoming more common. There have been a few instructionals on the topic, including an upcoming release by the Godfather of BJJ Blogging, Aesopian. If you're not familiar with the term, it is basically a back position where instead of putting your legs around their waist, you swivel and put them around their arm instead, while controlling the other arm with at least one of yours. Jacobs entered the position by attacking the turtle. Reach inside their arm and grab a sleeve. Jacobs prefers this to the wrist, because it gives you enough slack to escape should they reach back and grab your elbow. They're intending to roll you over and take side control, but they can't easily lock that elbow if you are able to pull your elbow back due to the looser sleeve grip. Shove your knee by the elbow of that sleeve grip. If there isn't space, walk around to the other side (maintaining pressure as you do), grab the sleeve there and attempt to insert the knee. You can even grab both sleeves and keep switching side to side until you work your knee in. Once you do, try to hook their arm with your other leg and drag it back. This puts you in a downwards facing crucifix. You can get an armbar from there, using your legs (you can do a sort of lockdown too to hold it in place), though as ever I found it hard to get the right leverage point for the elbow. Alternatively, you can attack for a shoulder lock from turtle. Put the knee nearest their head slightly forward, making sure it is still controlling their arm. Turn to face their legs, grabbing their ankle to anchor yourself. Twist and swing the leg furthest from their head backwards, still hooking the arm. Do this movement gradually, as that shoulder lock can come on quickly, depending on their flexibility. Most of the time, people will somersault from the turtle crucifix to get into a position where they are now facing upwards. To maintain the crucifix, shrimp out a little so they can't drive their weight on top of you. Be careful not to shrimp too far, or they may be able to scoot down. If they can do that, their next step is to roll backwards, putting them straight into side control. Make sure to have an arm around the head grabbing their opposite collar (like a bow and arrow choke) to stop that escape route. If they manage to sit up, then adjust your legs into a sort of reverse omoplata position to get upright yourself, then walk backwards (still crucifixing their arm with the legs) to recover that upwards facing crucifix. Even if they stick out a knee for base, if you keep shimmying back, you'll eventually get them onto a weak angle where you can roll them back over. Alternatively, when they first sit up, that makes them vulnerable to that shoulder lock from earlier. Assuming they don't sit up and you manage to hold that upwards facing position, you have numerous chokes available to you. Snake an arm around the neck and grab the opposite collar for a bow and arrow type attack. You can also grab the other collar for a sliding choke, then there is always the rear naked choke. If your arms are long enough, driving an arm past their armpit and behind their head while you also have that bow and arrow type grip works too. Again, Jacobs prefers to armbar. He does the main one with his legs on their crucifixed arm. Keep adjusting your feet and slipping them up to the wrist, wriggling their arm in position. Don't ever step both feet off the arm, only one at a time to maintain control. Swing your leg back past the knee line of the other each time. Eventually you find it gets tighter and tighter, until you can press on their wrist with your feet for the submission. Switching to a standard armbar is possible too, though there is a risk of losing position (as always with mounted armbars, it seems). The final part of the seminar was dedicated to wristlocks. This isn't something I have used much myself, but I'd like to add it in, given it's a great equaliser for smaller guys like me. The principle is very simple: any time you can isolate their arm so that their hand is pressing into you and their elbow is blocked, the wristlock is available. Their elbow might be blocked by the mat, or it might be you knee, or you might grab behind it with both hands. I was especially intrigued by a side control option, as I have had that exact grip numerous times but not known what to do with it. To get this side control wristlock, the situation is that they have tried to get an underhook, but you whizzered their arm. Trap their wrist in your armpit and grab their elbow with an arm to block its movement. Adjust with your armpit until you can use it to bend their hand back towards their wrist, then apply pressure for the sub. The other one that caught my interest was a wristlock from guard. Hold their sleeve and elbow, pulling the arm across like an arm drag: Jacobs calls this the 'short arm drag'. Wedge your knee next to their elbow, the other leg up into their armpit. That should immobilise the arm. Bring your sleeve grip elbow around the back of their hand, pressing in for the submission. You can also wristlock them if they try passing your half guard and grip a collar: same thing as before, isolate the arm and pull behind the elbow. Hence why Jacobs recommends grabbing the bicep when passing half guard like that, as that is far less vulnerable to wristlocks. I may call it "being mean", but I really mean "doing the move correctly," which means things such as pressure, encouraging them to turn certain ways by making other options miserable, staying tight even when I know it's miserable for them, keeping my weight on them, etc. All because that's how the move is properly done. To me, aggression -- for example, on that armbar above -- would be essentially kneeing them in the face to abruptly force their chin away. Muay Thai knees to the face and all. Instead, I'll use my knee to pressure and turn their chin, and then to keep it turned. I want them to react to the presence of my knee and the pressure from it, and not to the suddenness of my attack. A little late on the response here, but it was really great having you come train with us at our Academy at Tidewater! One of our instructors loves to regale us with tales regarding him and Jacobs coming up in the competition scene! We wish you could have stayed as we stayed for a couple of more hours just rolling with Dave. Once again, thank you for taking the time to visit us!